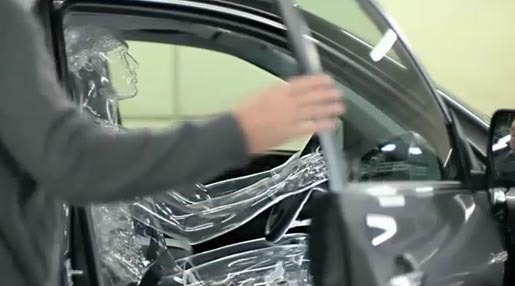 Toyota Australia is promoting THUMS (Toyota’s Human Model for Safety) with “Glass Organs”, a television commercial featuring a glass crash test dummy. Glass makers and blowers build a human and its organs out of glass before placing it in a Toyota for testing. Unfortunately, or perhaps fortunately, we don’t see what happens to the glass organs during a crash. The Glass Organs ad was developed at Saatchi & Saatchi Australia, Sydney, by creative director Steve Jackson, art director Simon Cox, copywriter Yanni Pounatzis, agency producer Kate Gooden. Filming was shot by director Noah Marshall via The Sweet Shop, with producer Tony Whyman, director of photography Ian McCarroll and production designer Igor Nay. Editor was Tim Mauger. Post production was by Marcus Thompson at The Lab Sydney (Digital Pictures). Sound and music were produced at Nylon Studios by composer Michael Yezerski and sound designer Anthony Aston.